Between N7 and Lake Ste. 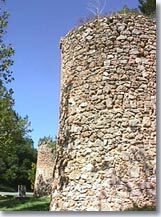 Croix, south of Aups (9km.) at the crossroads D560 and D22. Situated 20 minutes from Lake Ste. 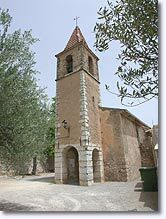 Croix and 60 minutes from the coast, Sillans la Cascade is a delightful village. 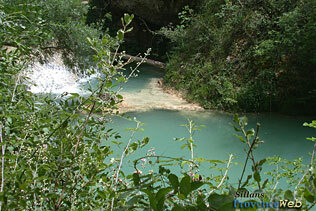 With its river, its wonderful shade, its waterfalls and the immense prairies, Sillans has much to offer to visitors. 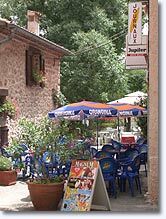 The village has kept its special medieval aspect that, all huddled together, resembles a big farm with a central court. inside one can admire the St. Etienne church (17th c.) with its pretty entry and stone facing, the ramparts with their towers and 11 th c, battlements, and the castle which has been under renovation since the town took it over. 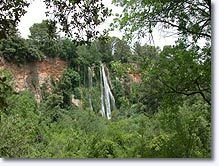 In Sillans there is also the waterfall. A pleasant walk of 800 m. through woods of century old plane trees leads to this wonderful cascade of 42 m. high. It is the waters of the Bresque, joined by those of the source of the castle of Bresc and the valley of Ourc that rush into the swirling water of the little lake below. St. Etienne church, The belfry. 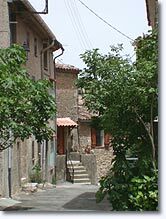 Cotignac (6 km), Salernes (6 km) and Fox Amphoux (9 km).